Whenever I’m stressed out or just need a pick-me-up, I love to have a bath. I always like to add a little something extra to the bath water, whether it’s Avon bubble bath or salts, or sometimes even both. 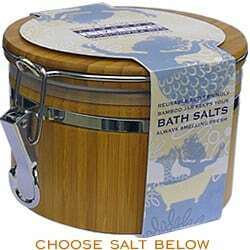 During my last two baths, I tried something new-to-me from San Francisco Bath Salt Company. The product I chose to review is a milk bath, which contains ingredients such as milk powder, coconut milk powder, ginseng powder, and a few other things. What surprised me most when I opened the bamboo container that the salt came in is that it was a fine powder. I’ve used salts before, but they’ve always been bigger chunks of it that are uncomfortable if you end up sitting on them in the bath. This powder effortlessly blended with the water, creating a milky look. The milk bath can be used for a full body soak, a foot spa, or even as a facial scrub. This bath salt will clean out your pores, moisturize your skin, and also exfoliate. 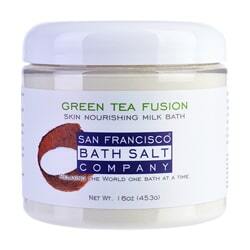 I chose the Green Tea Fusion milk bath and loved the subtle aroma that filled my bathroom. You can purchase it on their website for $8.99 for a 16 oz. jar. Your product can last up to 12 months if you keep your jar tightly sealed. I store my bamboo jar on the top of my toilet, and the small scooper in the bathroom drawer closest to my tub. For my baths so far, I used just one small scoop, but I might try adding more in next time for a more indulgent experience. The bamboo jar adds a little more life to our otherwise barren bathroom. The next time you need to de-stress or are in need of a thoughtful gift, consider any one of the salts this company has to offer. Valentine’s Day is fast approaching; why not make it memorable with a candlelit bath for your special someone? Check out the Valentine’s Day bath salts today! The Cold & Flu Bath Soak sounds great! I would love to use the Minera Dead Sea Salts. I’ve heard great things. I wanna try the Lavendar Bath Salt. Thanks for the giveaway…my wife wants to try the “Natural Pure Dead Sea Mud”. I would love to try the Himalayan Bath Salts. I am interested in the Peppermint Foot Soaks for Professional Use. I would like to try the White Sugar Scrub. A bath is always a great way to relax and putting something in the water to help your skin is a bonus.